California Hit and Run offenses can either be charged as a misdemeanor or as a felony. Hit and Run offenses involving property are charged as misdemeanors. An individual may be charged with misdemeanor Hit and Run if they are involved in a traffic collision that causes damage to the property of another and leave the scene of the collision without identifying themselves and providing their identification to the other parties. 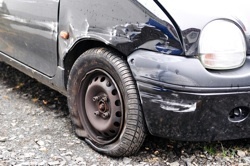 Hit and Run liability applies regardless of fault or amount of damage. Therefore, even if one party is not liable for the traffic collision but still leaves the scene of the accident they can be charged with a crime be charged with misdemeanor hit and run pursuant to California Vehicle Code Section 20002. CA Vehicle Code 20002 imposes certain requirements upon an individual involved in a collision that causes damage to another's property. This is typically another driver's car, but can also be any property, including bicycles, fences, homes or even pets. Immediately after the collision, the driver is required to stop, provide the other party or parties with their name and current address (even if they are not present at the scene, i.e. damage caused to a parked car), and provide a driver's license, vehicle registration, and insurance information upon request of the other party. If the driver is not the owner f the vehicle involved in the accident, they are required to provide a name and address of the car's registered owner. While California VC 20002 does not require drivers to exchange insurance information, a separate section of the Vehicle Code, California VC 16025, requires this. Violation of California VC 16025 is an infraction punishable by a fine of no more than $250. Convictions under California Vehicle Code Section 20002 can carry sentences of up to six months in jail, three years of summary probation, restitution to cover the damages caused and additional court-imposed fines and fees. Additionally the California Department of Motor Vehicle assesses two points to the driving record of an individual convicted of misdemeanor hit and run. There are many ways to challenge an allegation of misdemeanor Hit and Run. If the only damages were to the offender's vehicle and no damage was caused to anyone else's property, there is no criminal liability under VC 20002. Additionally, if the driver did not know they were involved in a collision, that person cannot be held liable for misdemeanor Hit and Run as the statute requires knowledge of the accident and intent to leave without providing pertinent information on the part of the driver. And if a defendant can establish that that they were not the driver at the time of the collision, he or she could not be prosecuted for misdemeanor Hit and Run. In many cases, a civil compromise may be allowed, which provides for dismissal of all criminal Hit and Run charges if the offender agrees to fully compensate any and all victims for damages caused. Allegations of hit and run may be associated with charges of Los Angeles Driving Under the Influence or DUI pursuant to California Vehicle Code Section 23152 and California Vehicle Code Section 23153. Los Angeles Hit and Run Defense Attorney Michael Kraut is an experienced Los Angeles defense attorney who defends individuals charged with Hit and Run. As a former Deputy District Attorney, Mr. Kraut knows how to present a case to a prosecutor or jury and fights tirelessly for his client to ensure the best representation possible. For more information about the various ways to handle a Hit and Run charge, and to schedule your free consultation, contact Los Angeles Hit and Run Attorney Michael Kraut at the Kraut Law Group. Mr. Kraut can be reached 24/7 at 888-334-6344 or 323-464-6453.